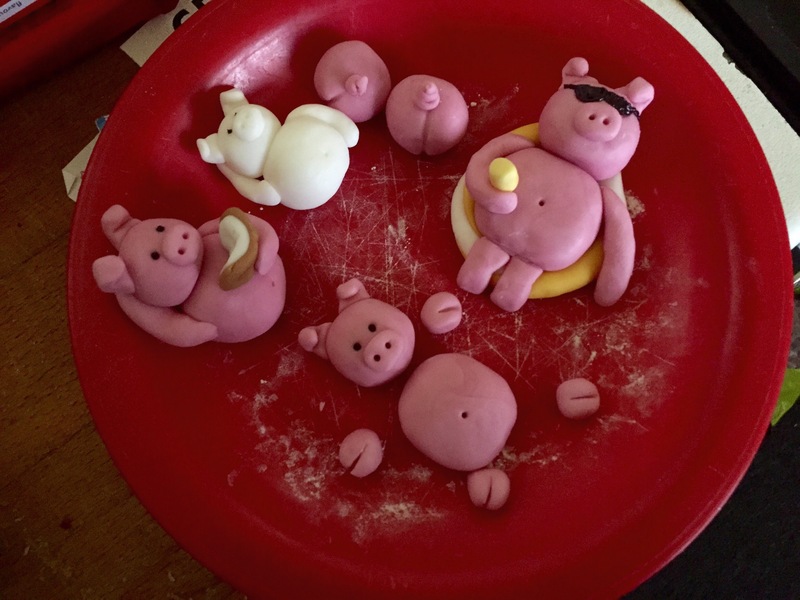 I loved plasticine as a child, and used to make all sorts of figures out of it. 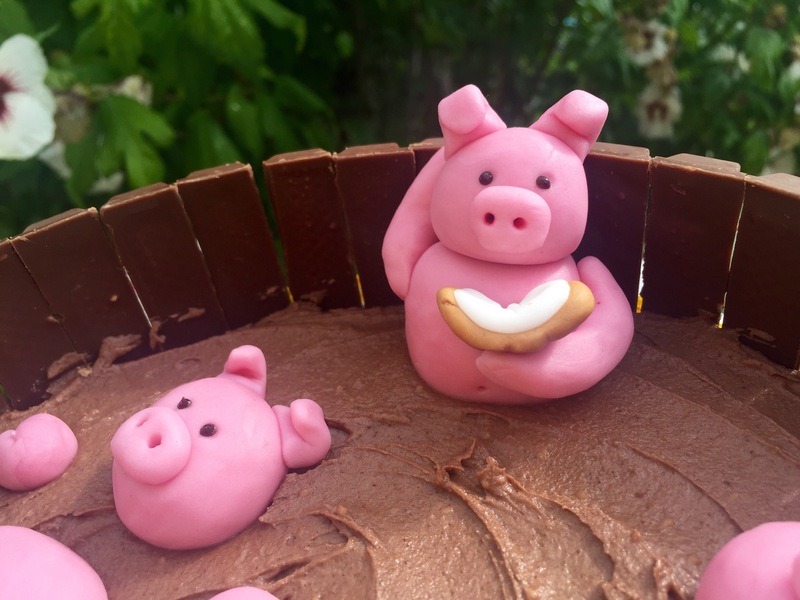 Pumpkins, animals, my dad…yes, really. 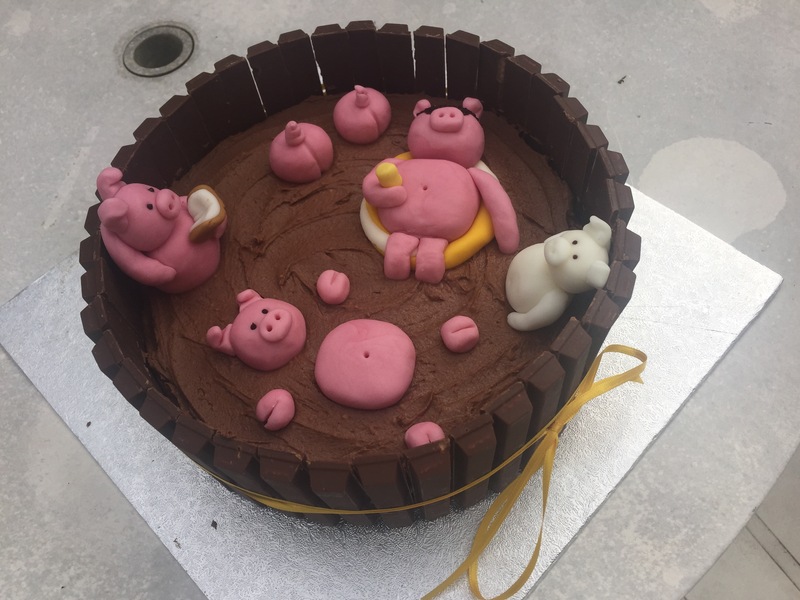 So when I saw this ‘Pigs in Mud’ cake, I saw a challenge which would take me back to that misspent youth and let me try out a new cake recipe at the same time. 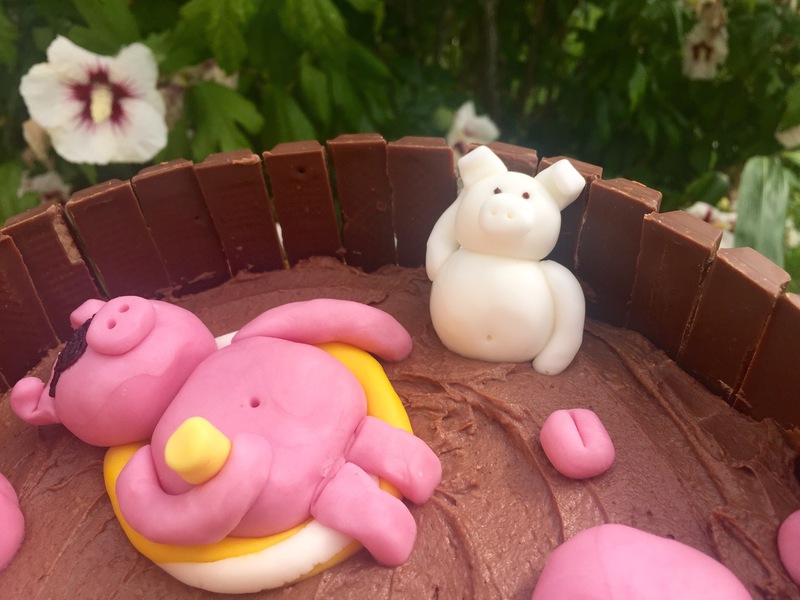 Introducing the Kitkat, vegan chocolate cake with vegan (almost) frosting and bathing piggies! 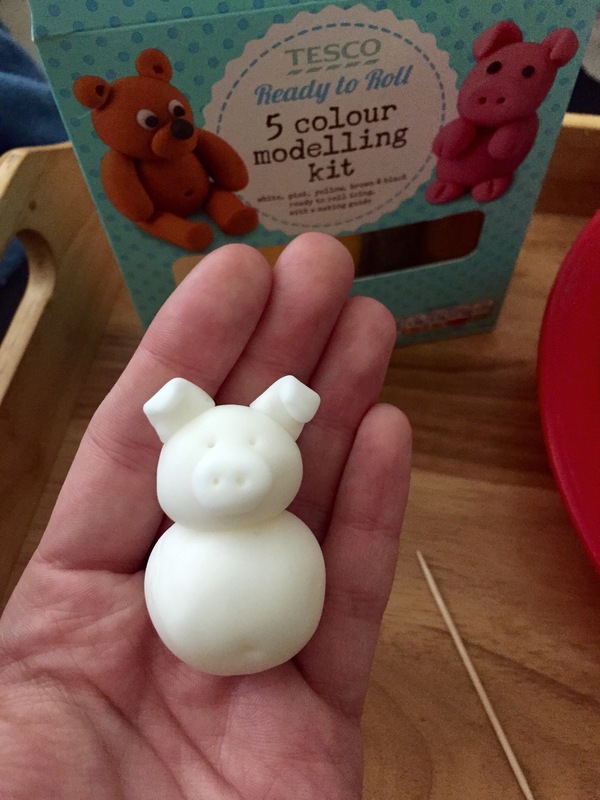 I started with the pigs and made a little one in white first to practise. 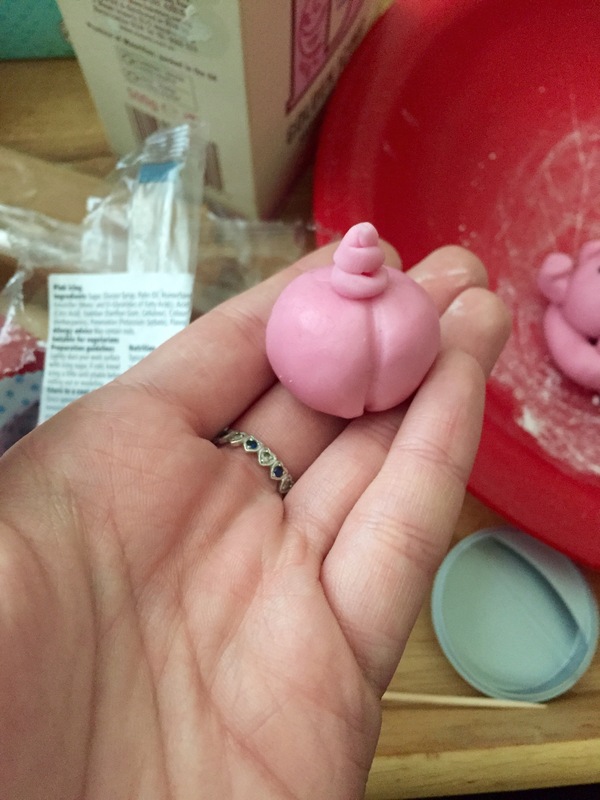 Making the body is really easy, just stick two round balls (the head smaller than the body) to each other with water if the icing isn’t sticky enough. The snout is a flattened round ball which I poked holes into with the cocktail stick. The ears are triangular and folded over at the top. 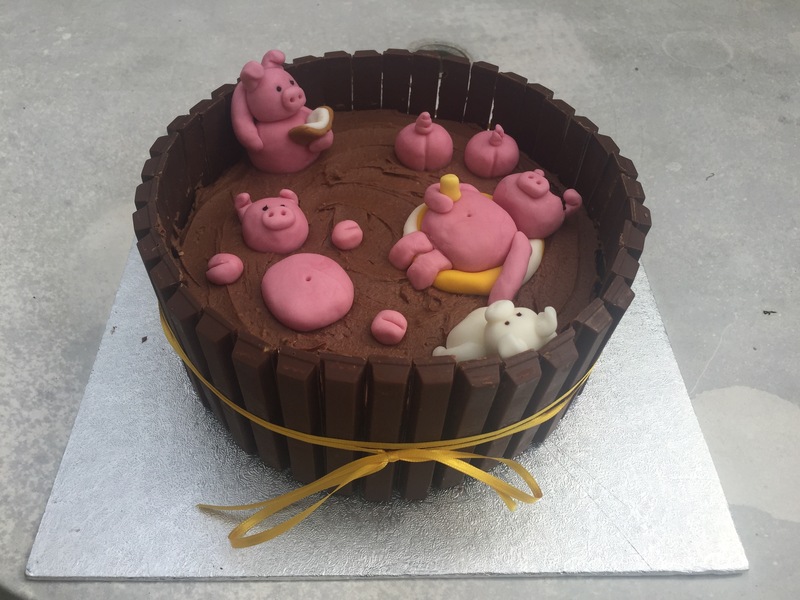 They’re a little fiddly, but stay stuck on once joined. For the arms, roll out longer, slimmer shapes, attach on the shoulder area and bend as desired, depending on the pose. For the eyes use dark chocolate or black writing icing to make two little dots. 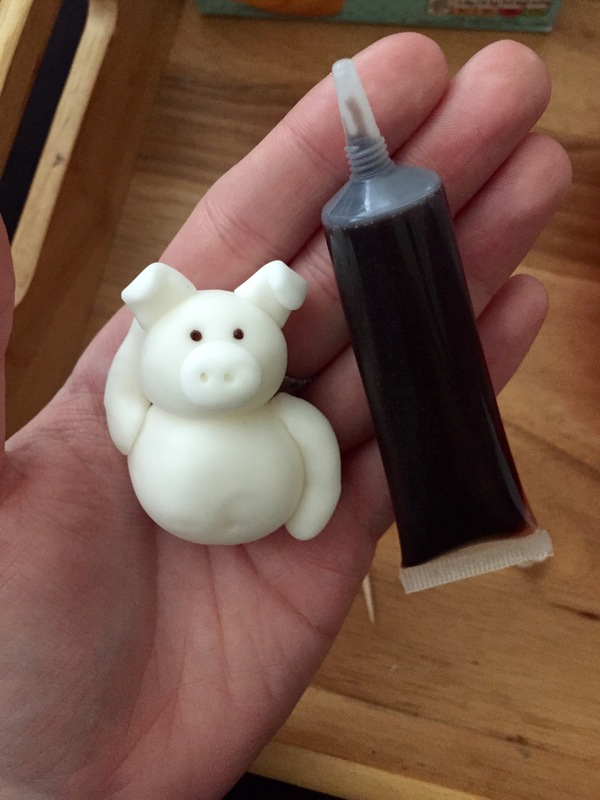 I found this much easier than making little black eyes out of fondant. 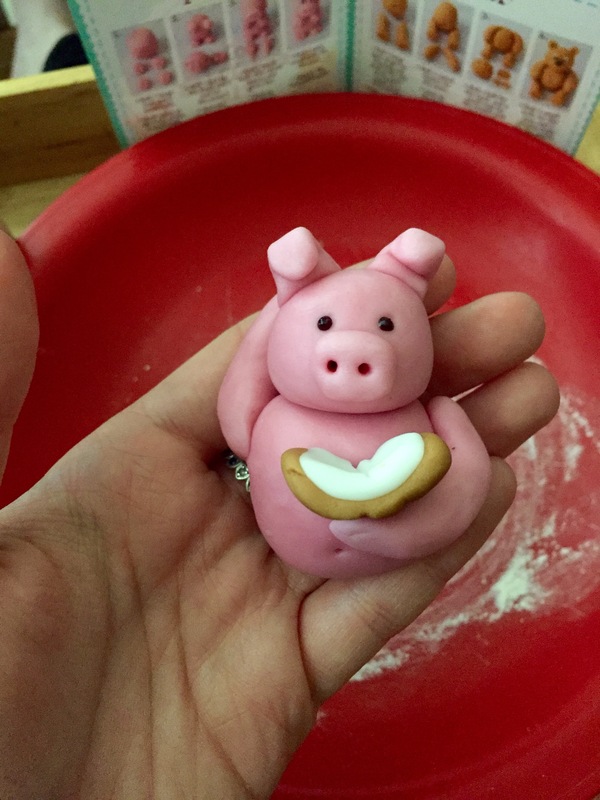 Once I was happy with my little white piggy, I made a pink one in the same way and added a little book for him to read in the mud bath! I have too much time on my hands, I know. 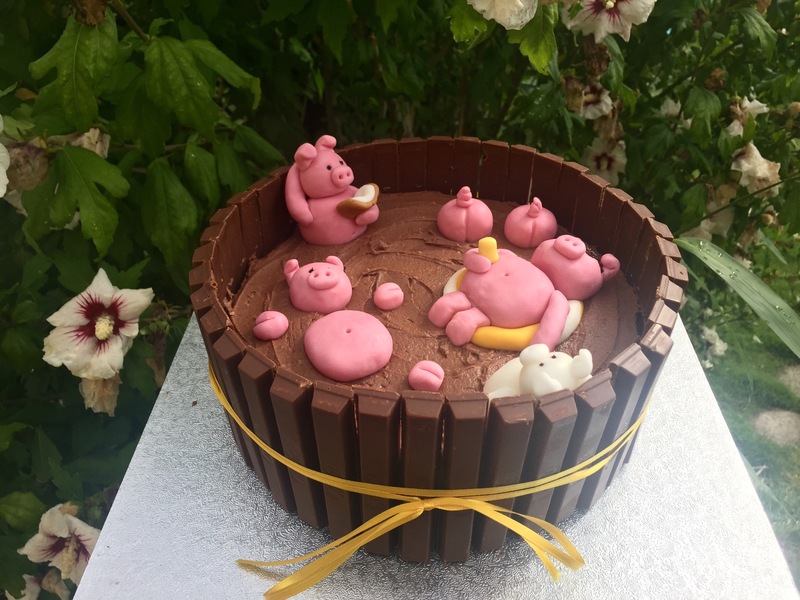 A lot of these cakes feature pigs with their bums and curly tails in the air, and I decided to do the same! 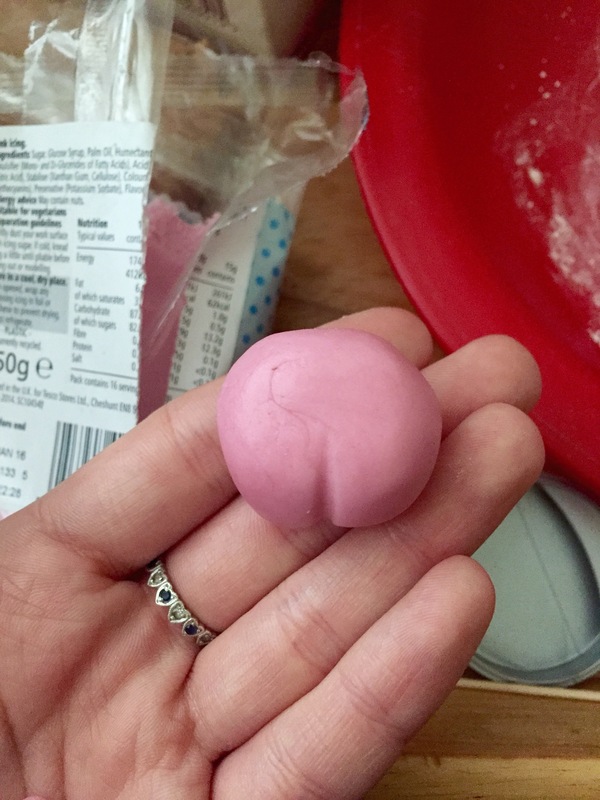 This is really easy, and only involves making a large round ball and using a cocktail stick to create a little crease down the back. 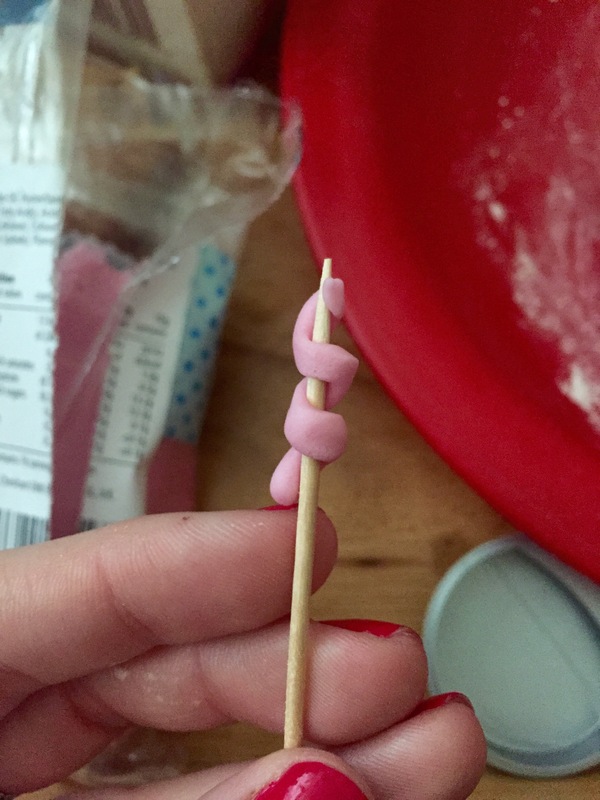 For the curly tail, roll out a very small pink string of icing and wrap around the cocktail stick. 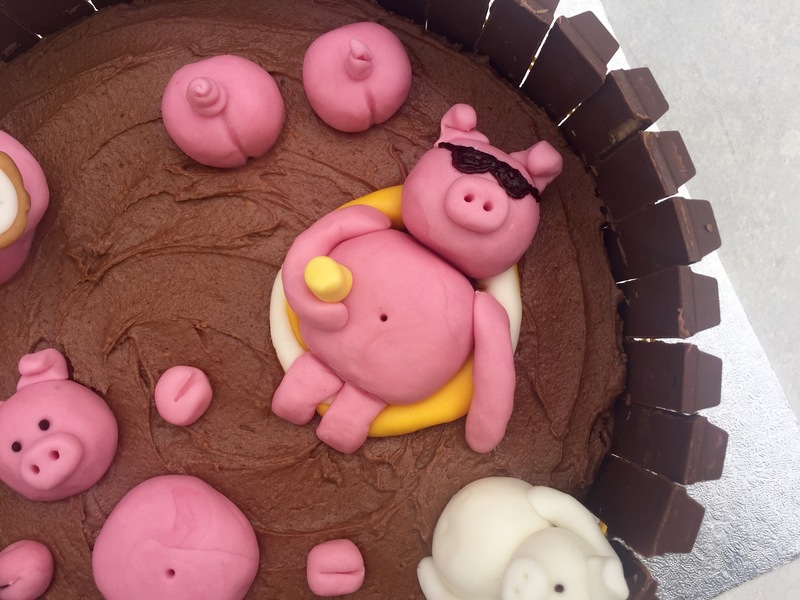 Leave for a few seconds, push up the cocktail stick and place above the crease on the pig’s bum. There’s no more eloquent way of putting it, I’m afraid. 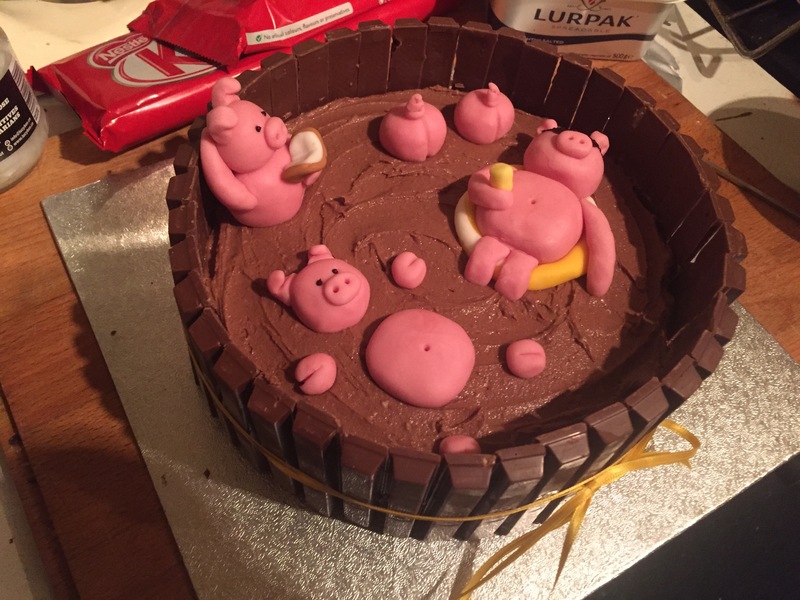 I decided to make another pig chill out in an inflatable ring. 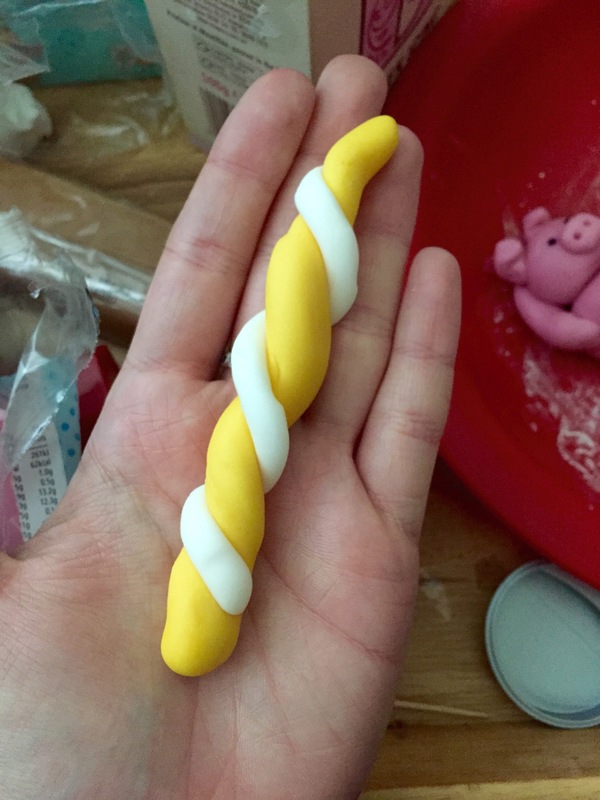 The ring was made by wrapping one colour of icing around another, twisting them together and then flattening them out. 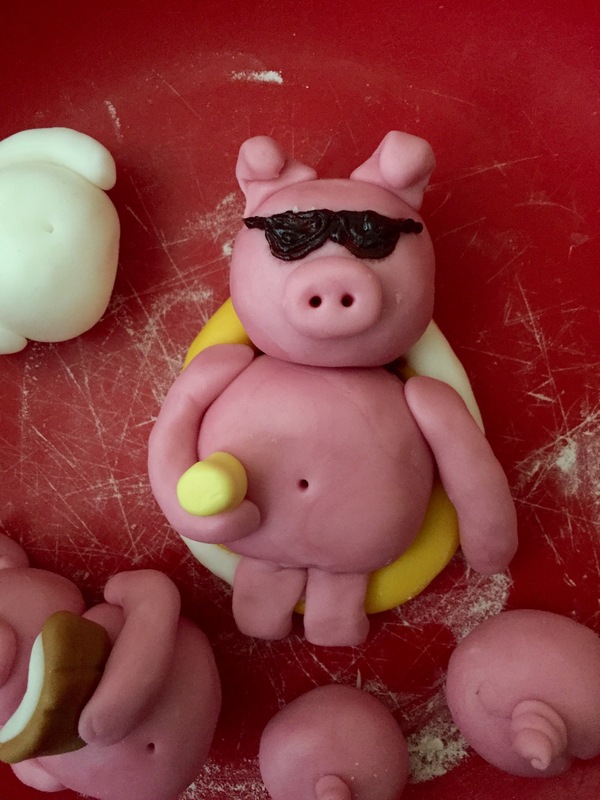 Make into a doughnut shape, place a big pink piggy belly inside it, attach the head, snout, ears, arms and legs (I included a drink too) and draw on a pair of sunglasses with writing icing if you wish! 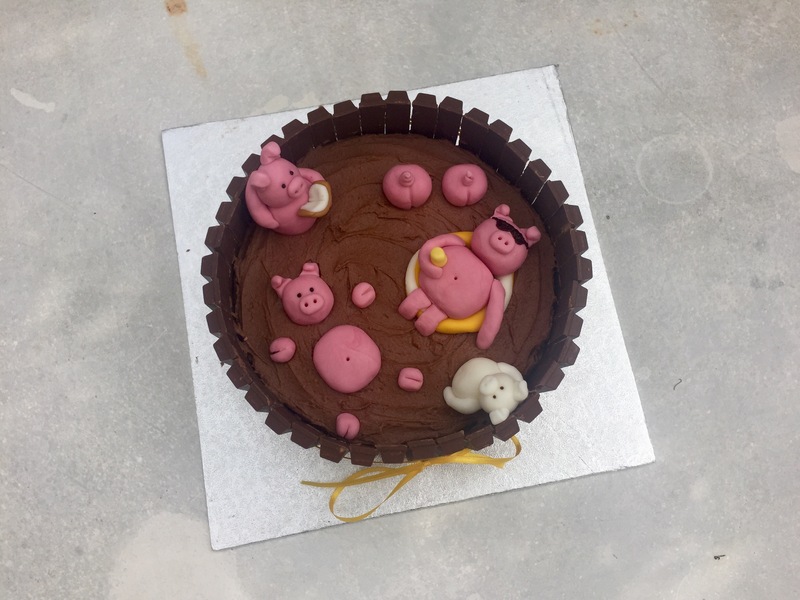 My final pig was going to be floating in the mud, so I made most of the components but left them disconnected, as you’ll see below. 1. Preheat oven to 180°C (160 for fan assisted)/355°F. 2. Grease and line 2 cake tins, mine are 8 inch tins. 3. In a large mixing bowl combine flour, cocoa, baking powder, baking soda and salt. 4. In a separate medium mixing bowl combine applesauce, sugar and vanilla and pour into dry ingredients. 5. Bake for 20-35 minutes or until cooked through and a skewer inserted removes clean. Remove and leave to cool on a wire rack. 1. In a bowl combine spread and cocoa powder, gradually mix in icing sugar, vanilla and add milk as needed to create your desired consistency. Job done! 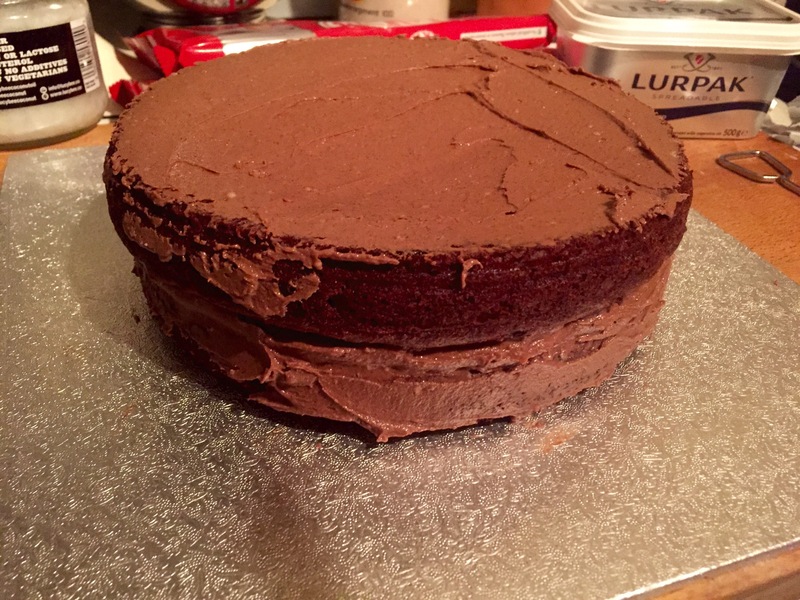 Place one fully cooled sponge on a cake board and layer the frosting on top of it. 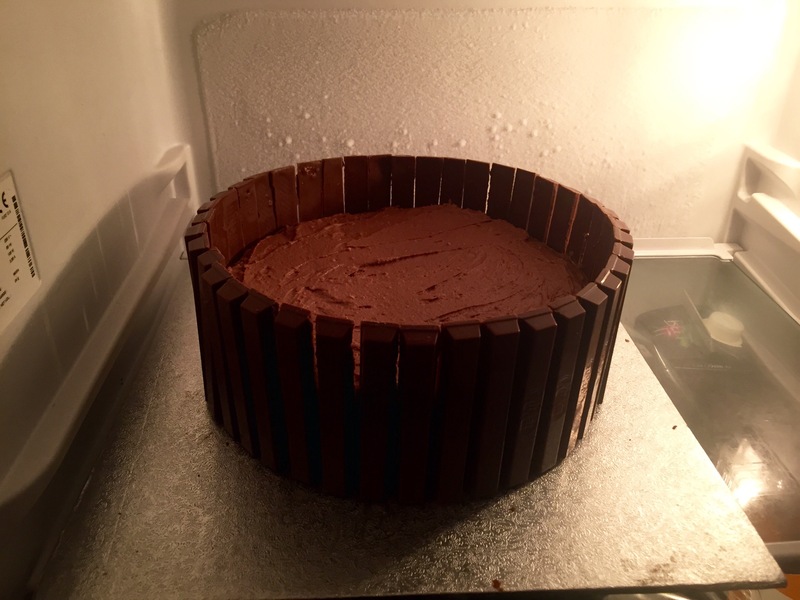 It’s also ok to spread the frosting down the sides as the Kitkat pieces will eventually be sticking to the sides anyway. 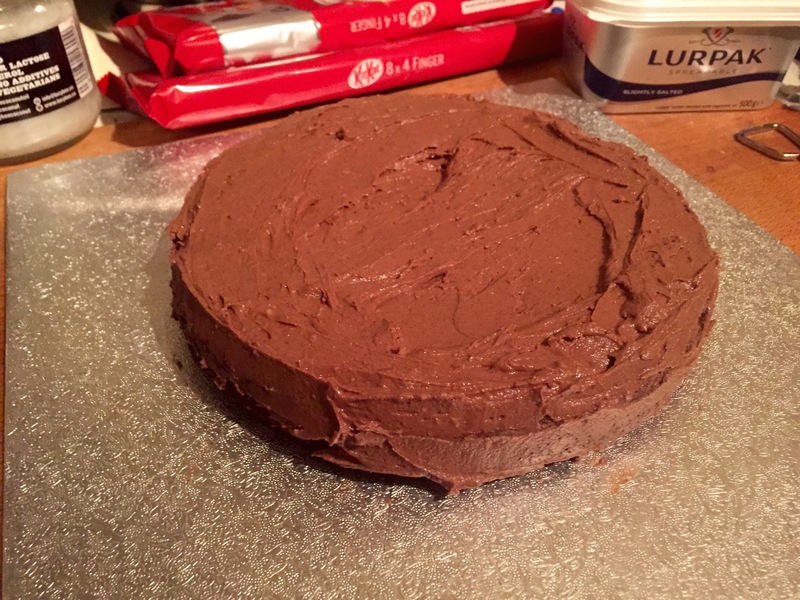 Place the second layer on top, and again cover fully with the frosting and spread down the sides. 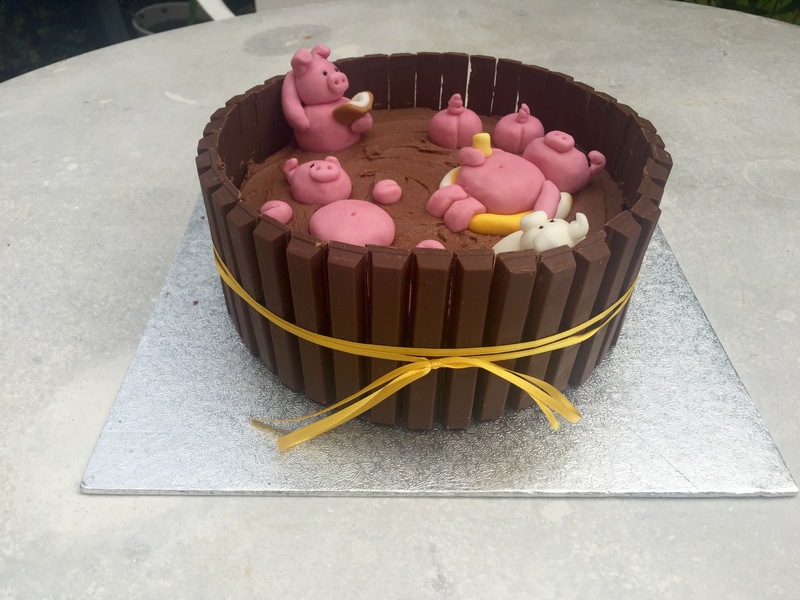 Begin to place the Kitkat sticks (I did them individually, some do them in their original pairs) around the cake, sticking them to the frosting. 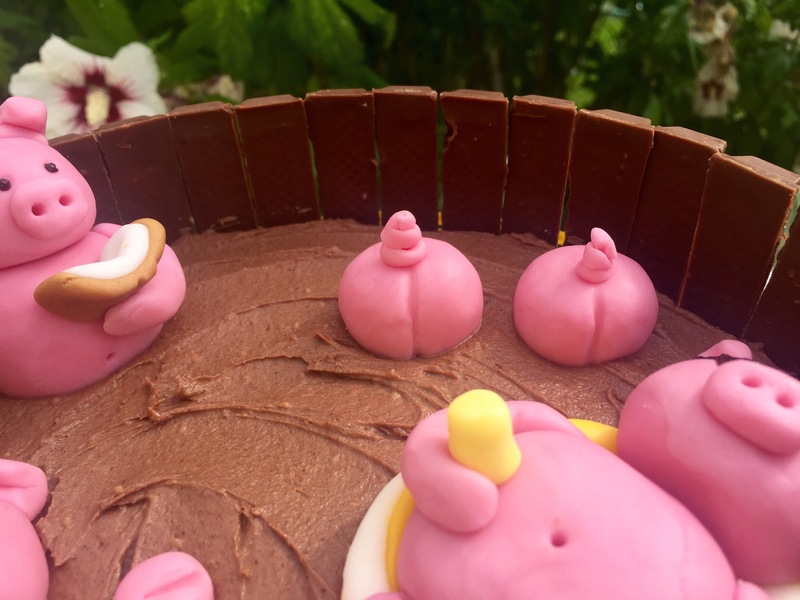 It’s a good idea to allow the frosting to set slightly so it’s not overly wet. Then place in the fridge for 15 minutes or so to set the Kitkats. 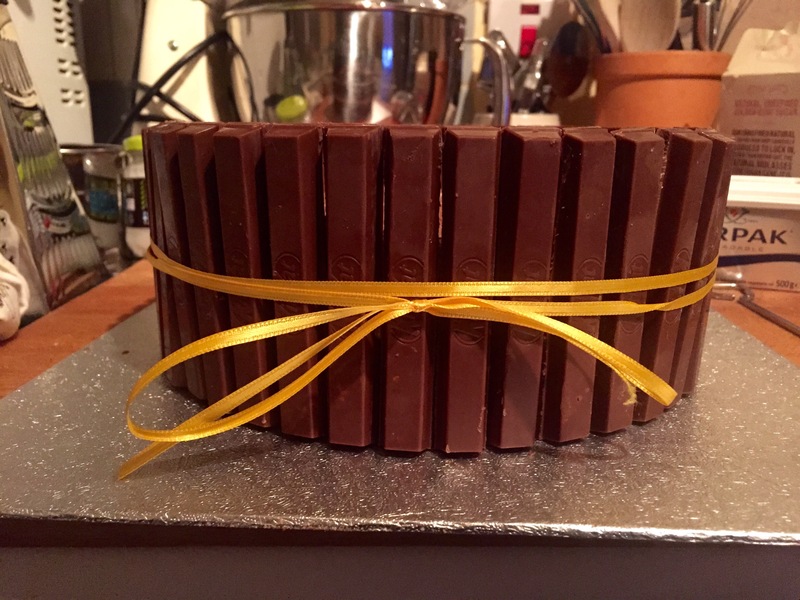 I then cut some yellow ribbon and wrapped it around the Kitkats both for decorative purposes and to secure them onto the side of the sponge. 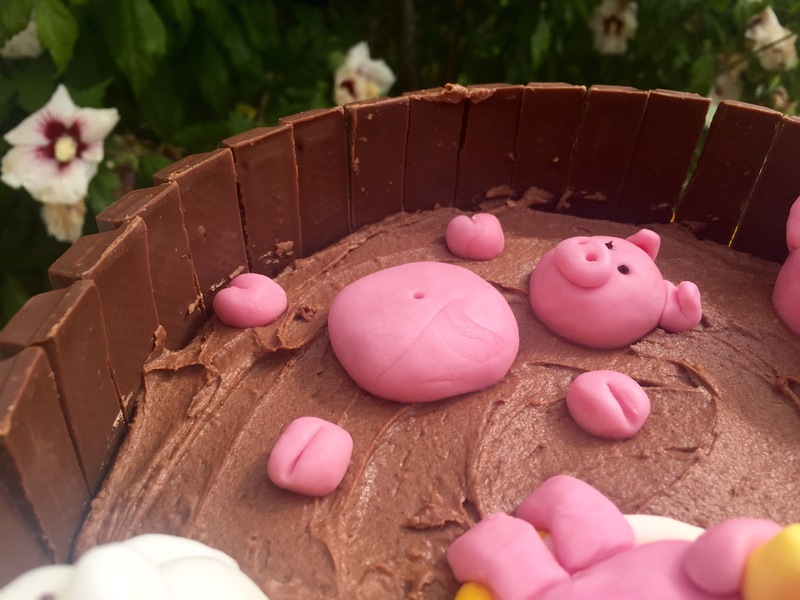 Now, the top layer of frosting needs to be quite deep to really look like a mud bath. 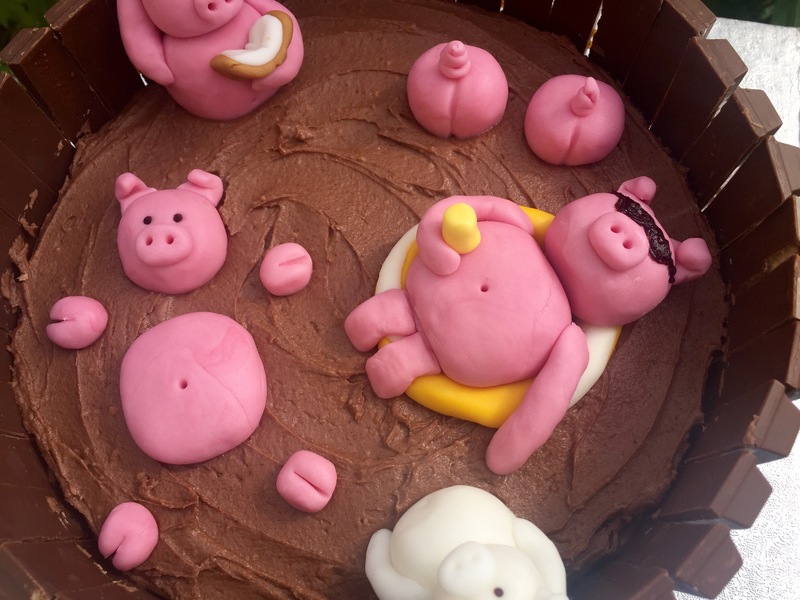 so I kept on smoothing frosting onto the top and eventually gently pressed the little pigs down into the frosting. I took so many photos. 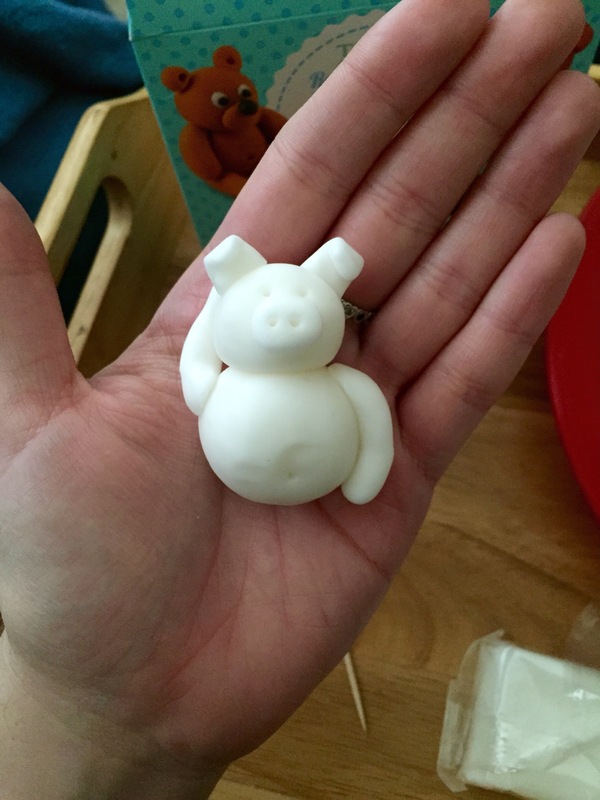 Anyway, I decided to add in my little white practice pig and refrigerated the cake overnight. Perfect for photographing the next day! 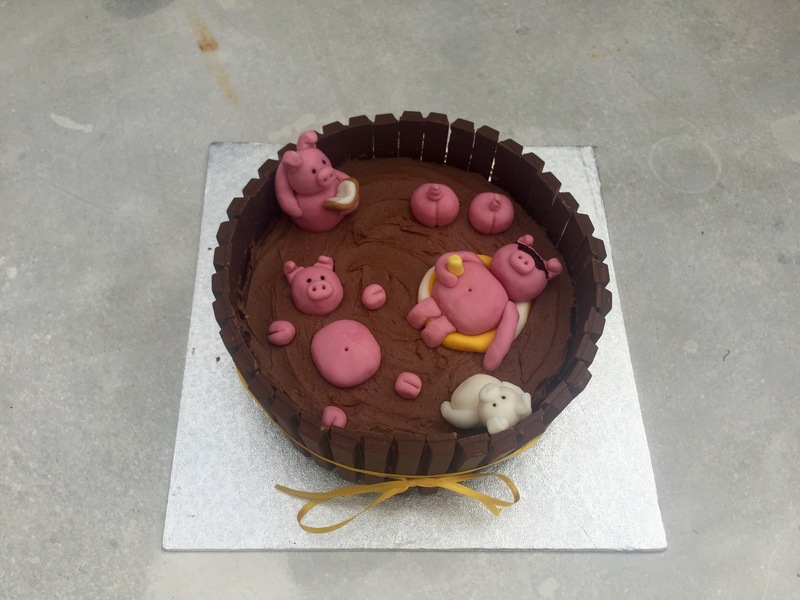 The remainder of the photos are all close ups of the cake, which was actually a lot easier to do than I expected. If you’re going to give it a go, have a little patience and make sure you’ve got clean hands and plenty of time! I would love to see how you get on! Thank you! 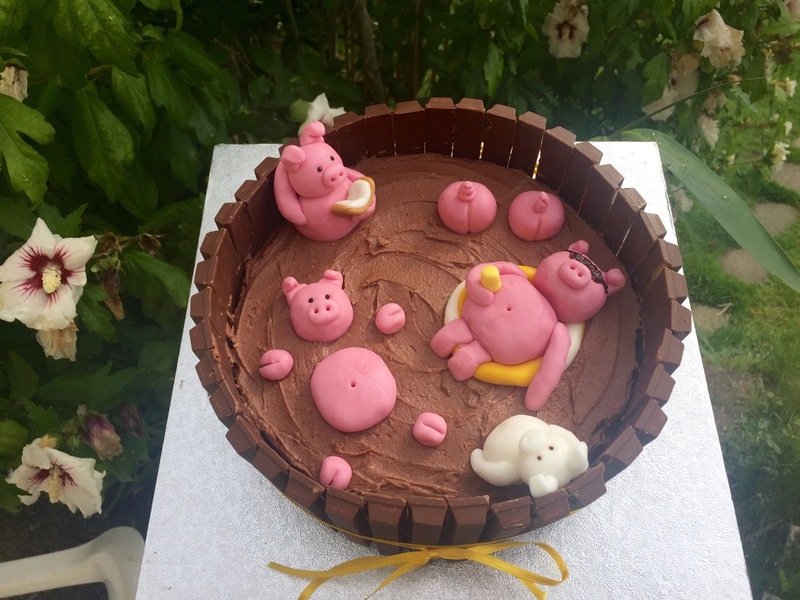 😊 it was delicious and so much fun to make! Love it! Am seriously considering giving it a go!